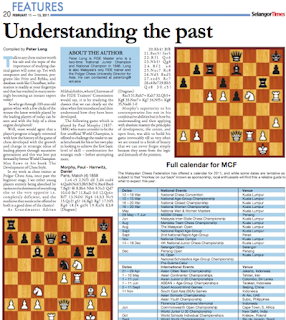 hairulovchessmaniac: Chess Column in Selangor Times! Chess Column in Selangor Times! As a chess player, i'm glad to hear that a chess column will make a permanent feature ( every two weeks) in a local newspaper - Selangor Times. The author of the column is FM Peter Long. He has previously write chess columns in major national newspapers. Peter is two time National Junior Champion, Malaysian Champion in 1986. He is an experienced chess player/trainer/chess event organizer/arbiter and has served as Executive Secretary of the Malaysian Chess Federation. Peter is currently the Director of the Polgar Chess University in Asia. The chess column will appear every two weeks but unfortunately, the paper’s web site isn’t up yet so anyone interested to read it have to get the hard copy. Andrew Ooi mentioned in his blog that the newspaper is available for free and can be obtained from malls, LRT stations and 7-eleven outlets. (probably in Selangor and KL only? ).